Make It Big Together – Big Business Events hosts Floyd Mayweather. 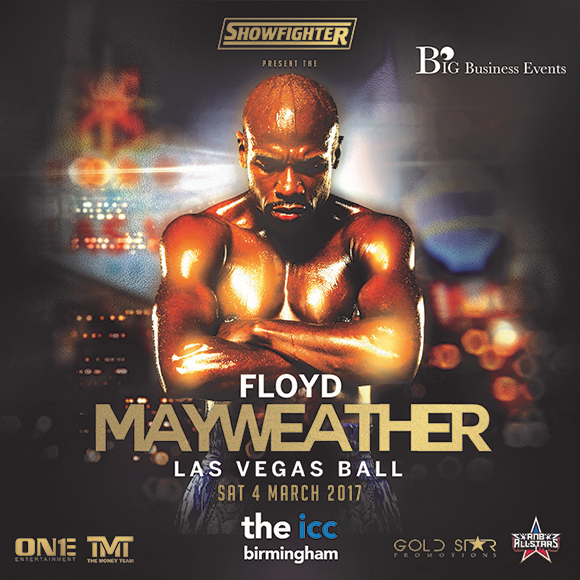 Big Business Events are incredibly proud to be the headline sponsor of the Birmingham leg of Floyd Mayweather’s Las Vegas Ball. Floyd Mayweather needs no introduction at all, as one of the world’s greatest ever boxers he is a sportsman who transcends his sport and has been called the best ever. Thanks in part to his huge social media following he also known all over the world as one sports world’s most astute businessmen. As headline sponsor, we are able to offer you the chance to join us and meet the man himself. You ‘ll get the full VIP treatment from the minute you arrive at this prestigious event at Birmingham’s ICC on 4th March 2017. Big Business Events provide high-quality seminars and courses on a range of business topics including marketing, social media, finance, recruitment, sales and lead generation. We strive to offer all of our members and clients to best value for money, with that in mind you’ll not only be joining us a the event, we’ll also be providing a day of celebrity branding training prior to the event. Full five-hour celebrity branding training hosted by Big Business events in Birmingham with ample opportunity to network with other successful business people. Entry to a high-quality star-studded evening with dinner and drinks on a VIP table at Floyd Mayweather’s’ Las Vegas Ball at Birmingham ICC. The once in a lifetime opportunity to meet and have your picture taken with Floyd Mayweather. Front row viewing of the Haye vs Bellew heavyweight boxing match on the big screen. Big Business Events are committed to providing the best possible service to our clients and we believe this amazing package offers outstanding value at just £997.00 per person. Big Business Events Co-Founder Adam Stott is no stranger to connecting with highly influential celebrities having previously been on stage with Al Pacino, Calvin Klein, 50 Cent and John Travolta on a recent business trip to America. Adam is passionate about business and thrives on his ability to offer all Big Business Events clients high-level networking opportunities. Co-Founder and BBC ‘The Apprentice’ winner Lee McQueen is a business heavyweight having built his recruitment company Raw Talent Recruitment from nothing to employing thirty staff and a turnover of £32m. Having won many awards in his hometown of Oxfordshire, Lee has met Prime Minister Tony Blair and had dealings with Sir Chris Hoy, Sir Trevor McDonald and David Seaman. At the time of this post, just two seats are available. If you’d like to join us at this event please contact us without delay. Click here to contact us about this event.